The perfect replacement battery for the failed or tired deep cycle battery in your 4×4, caravan, camper trailer, motorhome or boat. The 6-CNFJ-90 Lead Crystal Battery has a 100Ah rating at C20, is the same size as the common N70ZZ or 100Ah AGM/GEL and can be charged at a much higher rate than any other battery due to its low internal resistance. Installing a new auxiliary battery system or simply replacing your tired or failed deep cycle battery with Lead Crystal will guarantee increased performance right away. At GlobalSat, we have had amazing results with these batteries in every application. We are discharging them at a higher rate for longer and charging them at a higher rate much faster. Better with heat & vibration + 3 year warranty (T’s & C’s apply), 99% recyclable, safe and high performing, Lead Crystal is amazing value for money. GlobalSat is an eco-conscious company that promotes sustainable products – when it comes to batteries, unlike Lithium, Lead Crystal is the sustainable choice now and for the future! Up to 99% Recyclable and increased sustainability. Cleaner Less acid, no cadmium or antimony. Complies with strict international standards on protection of the environment. Safer No risk of leakage, less harmful chemicals, less fluids because of crystallization. Easy transportation Classified as non-hazardous for transport. The only battery allowed as normal goods air-freight. Guaranteed quality Each battery comes with a standard 3 year factory warranty. Better usage performance Charges up to two times faster than conventional alternatives. Excellent high-current discharge. Full recovery Can be 100% discharged and then restored to full rated capacity daily. Long battery life Float service life up to 18 years. Up to 6000 charge/discharge cycles (20% DOD). Long shelf life Can be stored 2 years with no refresh charging required. Simplifies logistics. 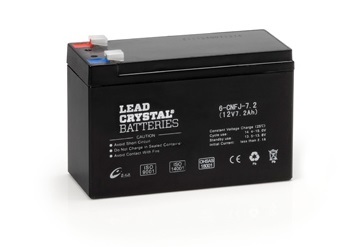 The Lead Crystal Battery has an amazing cycle life. Now a typical AGM will get about 500 to 750 cycles at 50% depth of discharge (that is running down to only 50% of the battery capacity). 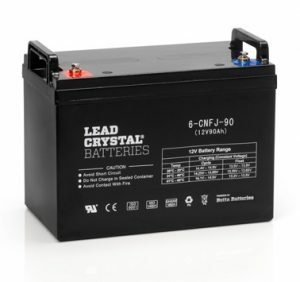 At 80% DOD a lead Crystal Battery will cycle some 1500 times. We can drop the voltage a lot lower so you can set your fridge to the 10.5 Low voltage cut-out and still get a long service life out of the batteries. A Lead Crystal battery does not sulphate so this means we can discharge this battery right down to near zero volts leave it there for a week and the battery will recover to normal. When charged / discharged the liquid electrolyte transforms into a crystallized state leaving hardly any liquid electrolyte. This opens a wide range of installation applications since the risk of electrolyte leakage is minimized. GlobalSat were responsible for designing and implementing the Map Patrol's entire electrical system, satellite communications, tracking and mapping equipment. 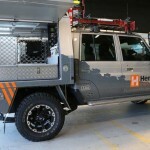 This included custom fabrication in the canopy to house and protect the heart of this advanced electrical system.